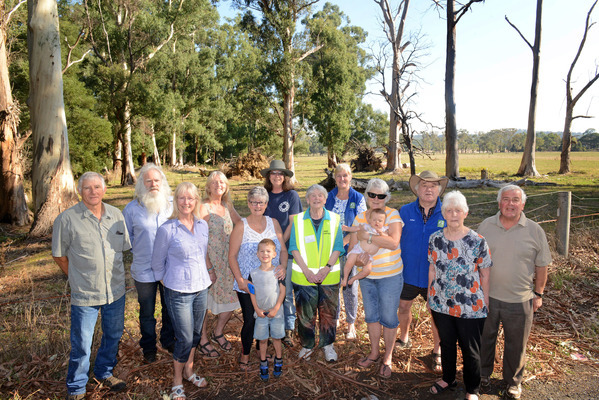 Conservation groups, represented by members Alan Scoble, Lawrence Gaffney, Sharon Murray, Susan Bellamy, Barb Conway with Jett Palmer, Kate Warne, Maureen Bond, Karen Garth, Sandra Palmer daughter Millie, Arthur Harford, Ruth Harrison and Michael Mifsud, want Haining Farm (background) revegetated as part of the Yellingbo Conservation Area. 179339_01. Picture: Rob Carew. As Yarra Ranges Council calls on the State Government to have the Don Valley community represented in the Haining Farm Implementation Committee, conservation groups, and the Department of Land, Water & Planning (DELWP) have defended the need, and methods, for revegetating the Don Valley farmland. While the plan for the farm to be revegetated as part of the Yellingbo Conservation Area has been approved, community input on the draft design plan is currently open, with the final Conservation Area Plan set to be released in June. Council supported Cr Jim Child’s motion to write to the Minister for Environment, Lily D’Ambrosio MP to appoint a Don Valley representative on the Haining Farm Implementation Committee. Members of Yarra Ranges Conservation Alliance (YRCA) attended the meeting, which came a week after a packed public meeting on Thursday, 23 March, called by the Yarra Waterways Group, which is continuing to lobby against aspects of the Yellingbo Conservation Area, including the inclusion of Haining Farm. YRCA convenor Karen Garth released a statement on behalf of the Alliance which comprises 16 environment groups across the Dandenong Ranges and Yarra Valley. They say Haining Farm’s future is more than a local issue. “The decisions made about Haining Farm are important beyond the interest of people living in the immediate vicinity of the farm. There are issues of important to the whole of the Yarra Valley and to the people of Melbourne and Victoria,” they stated. Remnant populations of the Helmeted Honeyeater and the Lowland Leadbeater’s Possum found only at Yellingbo are both threatened with extinction, imposing an obligation, they stated, on residents of Victoria and the Valley to protect and expand the remnant populations. “The Helmeted Honeyeater population is growing slowly with the aid of a captive-breeding program and habitat restoration, but the population of the Lowland Leadbeater’s Possum is in decline. While they remain confined to a small area of suitable habitat at Yellingbo, both remain at risk of extinction. 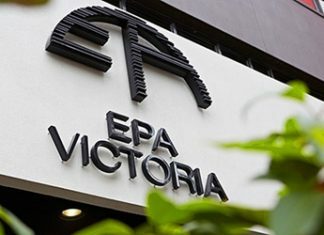 Defending the online poll conducted through the Engage Victoria website, the statement said the people of Victoria were clear and decisive about what they wanted for Haining Farm. The poll was criticised by the YWG after Zoos Victoria and Greening Australia ran an email and facebook campaign to thousands of members urging them to vote for a revegetation model. YWG spokesperson Rick Houlihan told the Yarra Junction meeting that while over the entire Yarra Ranges Shire 59% voted for the farming options proposed, votes received from across Australia resulted in an 80% vote for the revegetation option. YRCA say they recognise that some residents of Don Valley who live near Haining Farm have legitimate concerns about changes to their riparian crown land leases and “the perceived increase in bushfire risk from the revegetation of the farm” their concerns should not be allowed to override the interests of the wider Victorian community. “We accept the findings of the Haining Farm Bushfire Report,” the statement says. “This is an issue for the state and has also national and international significance. DELWP has also defended the process that went in to deciding on the chosen option saying it is detailed in the Haining Farm Engagement Report available on the Engage Victoria website. Addressing a number of questions put by the Mail, DELWP say all three concepts put forward were assessed as not increasing bushfire risk and that the 13 person working group which included seven Don Valley residents, approved all three concepts for release to the broader community. Addressing some of the issues raised at the public meeting, DELWP says all the options, including the approved option, feature bushfire mitigation measures. Haining Farm will be incorporated into the Fire Operations plan for the Yarra District ensuring that it will be part of a rolling three-year plan which prescribes the bushfire mitigation works to occur, ensuring security of ongoing attention and funding for bushfire mitigation. They say measures to control pests and weeds are also included including a deer-proof fence and treatment for weeds. The implementation of the project has been funded to $3.7 million.